Photo By Courtesy Of Vegetable Butcher MADE WITH LOVE Vegetable Butcher in downtown SLO is hosting a free Thanksgiving dinner for fire victims. 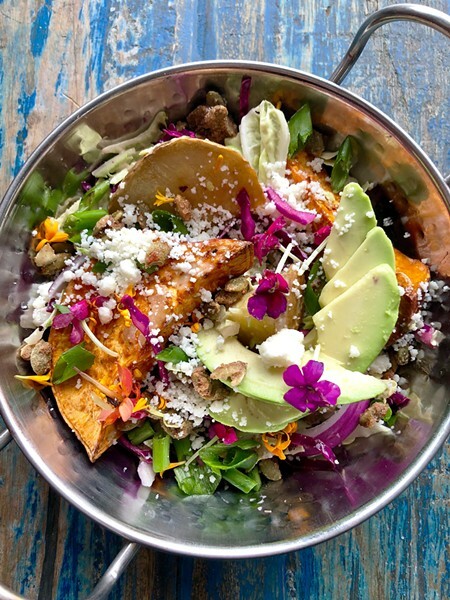 Included is this dish: A spring yam, avocado, and cabbage slaw with rosemary, poblano, queso fresco, pepitas, and flower petals. Vegetable Butcher in downtown SLO will open its doors on Thanksgiving Day to provide a complimentary dinner to wildfire evacuees and first responders in the area. Restaurant chef and co-owner Becky Windel told New Times the idea came to her after the Camp and Woolsey fires in Northern and Southern California destroyed thousands of homes and killed dozens. "I just imagine there are so many out there who just don't have a place to go for Thanksgiving," Windel said. "I just quickly thought, since we're closed on Thanksgiving, it's easy for me." Members of the Central Coast restaurant, wine, and agricultural community are contributing to the meal, including RobinSong Farm, Babe Farms, The Berry Man, Sextant Wines, Chamisal Vineyards, Big Sky Café, Del Monte Café, and Chef's Warehouse. SLO Mayor Heidi Harmon is expected to make an appearance at the dinner as well. "We've had so many people come forward," Windel said. "We're prepared to feed 100 to 130 people." The dinner will take place from 1 to 4 p.m. on Nov. 22 at 712 Marsh St. Evacuees or first responders should RSVP by sending an email to vegetablebutcherslo.events@gmail.com. The restaurant will respond with how to register to be on the guest list.